Seymour is a rural town in central northern Victoria, 100 km north of Melbourne. It is on the Goulburn River, approximately where the river turns from running westwards to run northwards and join the Murray River. The European settlement of Seymour came about by it having a crossing over the Goulburn River which was more fordable than the one specified by the Surveyor General of New South Wales, Thomas Mitchell, at Mitchellstown. The new crossing place, which also cut the journey by about 10 km, attracted a punt by 1839, and shortly afterwards a hotel. In 1842 a township was surveyed at the new crossing place, and Mitchell persuaded the Executive Council of New South Wales to name it after Lord Seymour (1775-1855), an Oxford graduate in science and mathematics. The original crossing place has been obscured by the action of flooding, but is in the vicinity of Emily and Manners Streets. By the time of the 1851 gold discoveries Seymour had hotels, stores, a flour mill, but no school. It had also experienced in 1849 the first of its several floods. 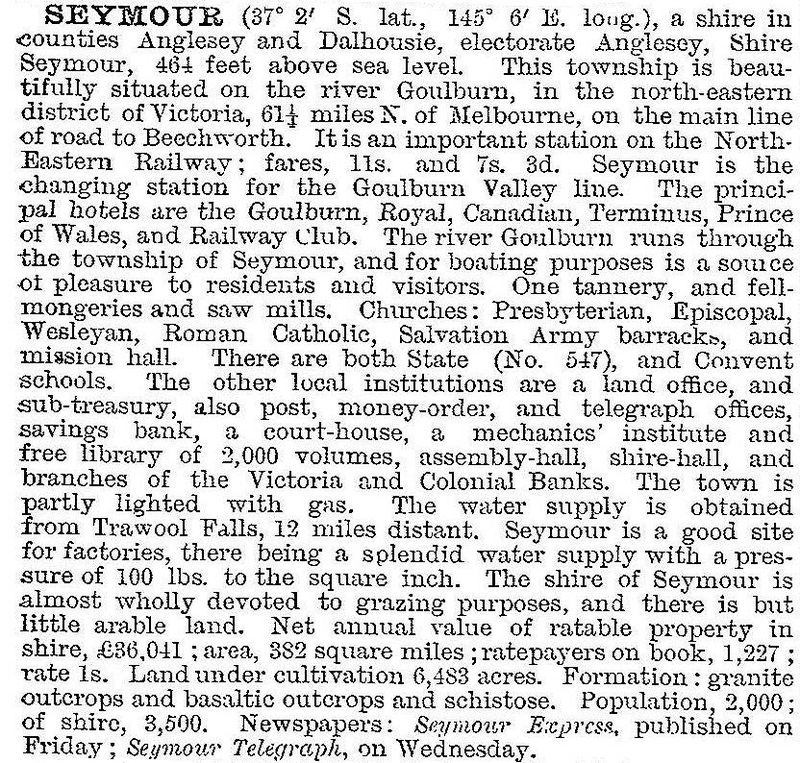 Seymour was well positioned on the Sydney road with travellers to the New South Wales goldfields, and again a few years later as miners crossed from Bendigo to the north-east goldfields. In 1863 a bridge replaced the punt, confirming Seymour’s position on the trunk road and overcoming a tendency for some traffic to ford the river at Tallarook. In 1857 a school was opened and the farming community was numerous enough to form an agricultural society. Methodist and Anglican churches were opened in 1860 and 1863, and a Road Board was formed in 1863. Seymour is situated on the edge of northern wheatlands and in close proximity to farm land fertilised by river alluvium. When it was connected by railway to Melbourne in 1872 it became a regional trans-shipment point. Railway workshops were also opened at Seymour, and rolling stock kept there for connection to or uncoupling from trains, as Seymour had flatter gradients than those of the Dividing Range immediately south. 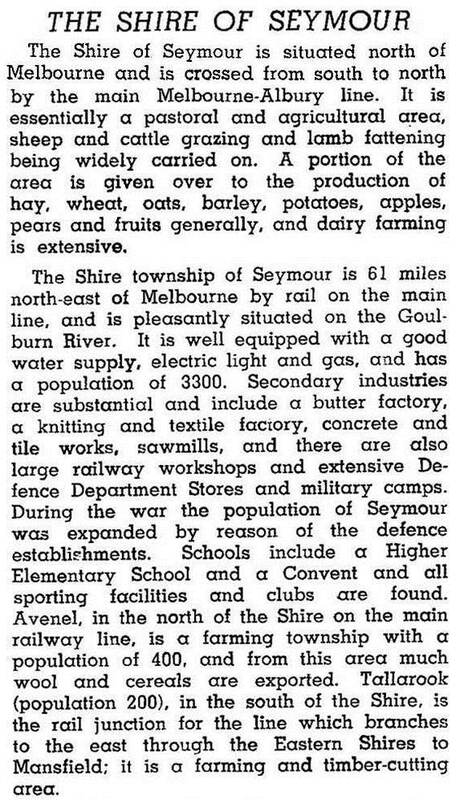 On 24 February 1871, the road district became Seymour shire. Emily Street had been the original town centre. The railways, probably wanting to avoid flooding, aligned with the railway line about 1 km south-east, creating a new town centre. Up to 600 people have been employed in the railways and a Railways Institute was opened in 1917. It became an important social centre, with tennis and bowling facilities nearby. In 1910 Field Marshall Kitchener visited Australia to advise on national defence. He proposed that Seymour, at the junction of major railway lines, be the site for a military training area. The Seymour camp, about 2 km east of Seymour in the direction of Trawool, became a major military training area during World War I. Housing was in severe shortage during the postwar years; by 1976 the Housing Commission had built 940 houses in the shire (mostly in Seymour township) or 46% of the shire’s housing stock. Seymour’s moderate industrialisation has depended on housing growth. Notwithstanding the reduction of railways employment as branch lines were closed and diesel trains needed less maintenance than steam, Seymour’s population doubled between the end of World War II and 1990. The locating of regional government offices in Seymour added to employment, and the first postwar population decline did not occur until 1991-96. In addition to the facilities already mentioned Seymour has Catholic primary and secondary schools, a comprehensive range of sporting facilities, a leading country racecourse, a hospital, several parks including Goulburn Park with a caravan and camping area beside the river, and a shopping centre which underwent expansion in 1982. The Hume Freeway bypassed Seymour at about the same time. There are several buildings to remind visitors of Seymour’s railway history, including the heritage-listed station (1874). The station’s refreshment room served thousands of meals to troops, prisoners of war, Bonegilla migrants and travellers. Northeast of the station there was a locomotive depot, which became a railway heritage centre in 1983. The Railways Institute’s tennis courts were redeveloped as the Spirit of Progress Park, named after the famed streamlined locomotive of the 1930s. Elsewhere in Seymour there are the heritage-listed log lock-up (c1855) and the Terminus Hotel (1897) in Station Street. On 2 November 1993, the shire was proclaimed a rural city, and on 18 November 1994, most of the rural city was united with Broadford and Pyalong shires and part of McIvor shire to form Mitchell shire. The rural city’s area was 945 sq km, and the same as the shire’s. In 1994, 68% of the shire was farmed, carrying 183,000 sheep and lambs and 15,000 meat cattle. Towns bypassed by the Hume Freeway came together in 2014 to market themselves to travellers as Old Hume Highway Route 31. The change during 1947-54 reflects the National Service training population at Puckapunyal.